English composer. Thomas Augustine Arne born in King Street, Covent Garden, London on or about March12th, 1710 and baptized eleven weeks later on May 28th, at the church of St. Paul's, Covent Garden. Arne's father and grandfather were both upholsterers and both became officials of the City Company of Upholsterers. His grandfather unfortunately fell upon hard times and died in the Marshalsea prison for debtors. Arne's father on the other hand earned enough money not only to rent a large house in Covent Garden but also to have his son Thomas educated at Eton College. But later in life he also managed to lose most of his wealth and had to earn extra cash by acting as a numberer of the boxes at Drury Lane Theatre. The young Arne was so keen on music that he smuggled a spinet into his room and, dampening the sounds with his handkerchief, would secretly practise during the night while the rest of the family slept. He also, according to the musical historian Charles Burney, dressed up as a liveryman in order to gain access to the gallery of the Italian Opera. It was at the opera that Arne first met the musician and composer Michael Festing. Festing was a major influence on Arne. He not only taught him to play the violin but also took him to various musical events including going to hear Roseingrave compete for the post of organist at Hanover Square and a visit to Oxford in 1733 to hear Handel's opera Athalia. Upon leaving school the future composer was articled to a solicitor for three years. However, according to Burney, Arne's father discovered his son leading a group of musicians at what was probably one of Festing's musical gatherings. Following this disclosure of his son's real interest and talent he was persuaded (again probably by Festing) to allow the young Arne to give up his legal career and to pursue music as a living. Arne was to suffer from one disadvantage; as a Roman Catholic he was debarred from many of the professional musical appointments open to others such as a Cathedral Organist or Master of the King's Band of Musick. One of his first acts upon being 'set free' from his law apprenticeship in 1732/3 was to teach his sister (Susanna Maria) and his brother (Richard) to sing. The three of them were amongst a group of musicians who gave a performance of Handel's Acis and Galatea at the Haymarket Theatre in April 1732. The three Arnes then joined forces with the musicians Henry Carey and J.F. Lampe. Arne's first composition of importance was his setting of Addison's Rosamond -- little of which has survived. The first performance was a family affair with his sister taking the principal part and the part of the page-boy taken by his brother at the theatre in Lincoln's Inn Fields in 1733. It was very successful and was repeated ten times. In 1736 Arne married Cecilia Young, the daughter of the organist of All Hallows Church, Barking. She was a soprano who had already gained great distinction in Handel's oratorios. It was during the years immediately following his marriage that Arne established himself with three very successful masques in succession. 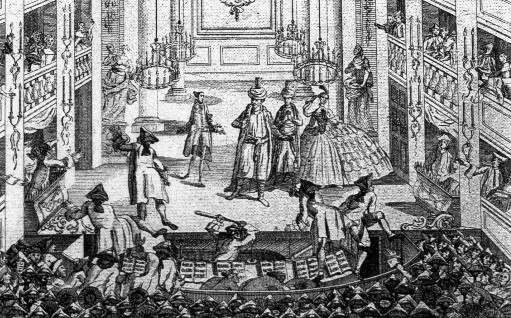 The first was Comus, first performed at Drury Lane Theatre on March 4th, 1738. It was subsequently performed many times during Arne's lifetime and even remained popular for a century after his death. It became a model for what was recognized as typical English music. Two years later in 1740 the second masque, The Judgement of Paris,was first performed at a fete given by the Prince of Wales at Cliveden in Buckinghamshire to celebrate the birthday of his daughter, the Princess Augusta, and also the anniversary of the accession of the House of Hanover. The final chorus of is unfortunately lost. For the same fete Arne wrote another masque The Masque of Althredwhich concludes with Rule Britannia. It also includes the particularly beautiful aria 'Arise, Sweet Messenger of the Morn'. At the end of 1740 Arne composed the music for the first in a series of Shakespeare's plays; As you Like It, Twelfth Night (1741), The Merchant of Venice (1742), The Tempest (1746) and Love's Labour's Lost (1747) followed. Arne traveled to Dublin with his wife in April 1742 to arrange a benefit concert for her at which Arne's sister Susanna (Mrs. Cibber) also sang. Throughout that Dublin music 'season' Arne introduced much music by Handel and of his own -- including, in 1744, the oratorio The Death of Abel. His hugely successful Colin & Phoebe established him in 1745 as the leading composer for the next twenty years at the London pleasure gardens of Vauxhall, Ranelagh and Marylebone. In 1750 following an argument with Garrick over her salary, Mrs. Cibber transferred to Covent Garden Theatre. Arne joined her there and there followed an ongoing battle between the two theatres, which only ended many years later when Mrs. Cibber returned to Drury Lane. Relationships between Arne and his wife had been far from perfect for many years. On their trip to Ireland in 1755 many concerts were postponed on account of Mrs. Arne's 'illness' which the composer claimed was 'passions, equal to raving madness'. Their marriage was at breaking point and Arne returned to London with his pupil Miss Brent while his wife stayed in Dublin. On formal separation, Arne contracted to support his wife with £40 a year. Arne managed to secure a singing part for his pupil Miss Brent in a very successful revival of The Beggar's Opera at Covent Garden. It ran for two months and was followed by The Jovial Crew with music by Arne. He was named D.Mus. in 1759 and thereafter was commonly called simply "Dr. Arne,"
In 1761 Arne staged a performance of his oratorio Judith at Drury Lane and in the following year produced Handel's Alexander's Feast. John Stanley and John Christopher Smith were both angered by this as they had taken upon themselves the task of performing Handel's oratorios since his death; in retaliation they staged performances of various Handel oratorios in direct competition with Arne. Arne ultimately acknowledged defeat. February 1762 saw Arne's greatest ever success; the performance of his opera Artaxerxes at Covent Garden (left). It remained a favourite with the public and was performed regularly until well into the nineteenth century. Haydn was so impressed when he saw it that he said he, "had no idea we had such an opera in the English Language". Artaxerxes was followed by Love in a Village as his career reached a peak. In 1764 he had much success with his masque The Arcadian Nuptials, written to celebrate the marriage of the Prince of Brunswick and Princess Augusta, but the comic opera The Guardian Outwitted ran for only six nights. In 1766 Arne's sister Mrs. Cibber died and Miss Brent married the violinist Pinto. In 1767 Arne's Four Symphonies were published in London by John Johnston. They show Arne keeping up-to-date with changing musical fashions, reflecting as they do the increasingly popular symphonic style of J.C. Bach--who had come to London five years previously--and Haydn. 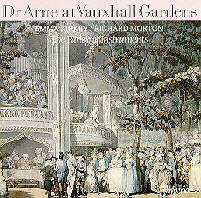 Arne revived Artaxerxes at Drury Lane in 1768 but a rival production at Covent Garden with Mrs. Pinto in the lead role proved more successful. Following the disappointment of his Drury Lane production Arne had little to do with the Theatre but did however become a member of the Noblemen and Gentlemen's Catch Club and the Madrigal Society. He gave yearly concerts, which he claimed were 'the first entertainment of the kind exhibited in this, or any other kingdom", at Ranelagh Pleasure Gardens, comprising songs, catches and glees. Unfortunately, the lack of theatre work reduced his income considerable and in 1770 his wife threatened legal action after he fell behind in his regular payments to her by £10. The last years of Arne's life saw performances of some of his most successful works including Shakespeare Ode (1769), the masque The Fairy Queen (1771), May Day (1775) and Caractacus. In October 1777, after a separation of more than 20 years, Mr. and Mrs. Arne were reunited. Unfortunately, their presumed joy at being back together only lasted a few months as Arne became seriously ill and died on March 5th, 1778. He left his property and all his possessions to "my beloved wife Cecilia and my only son Michael". He was buried in St. Paul's Church, Covent Garden where he had been baptized 78 years previously. During Arne's own lifetime, his works enjoyed a greater success and popularity than those of any other previous English composer, including Purcell. In his 'General History of Music' Charles Burney wrote, "The melody of Arne at this time forms an era in English Music; it was so easy, natural and agreeable to the whole kingdom, that it had an effect upon our national taste." He composed some 88 works for the stage, including Comus(1738); Don John(1740); Alfred(1740); Henry and Emma(1749); Don Saverio(1750); The Sheep-Shearing(1754); Eliza(1754); Thomas and Sally, or The Sailors Return(1760); Artaxerxes(1762); Love in a Village(1762), and May-Day(1755). He also composed many individual songs as well as songs for productions of The Tempest, As You Like It, and other Shakespeare plays; oratorios (Judith,1761); odes, cantatas; catches and glees; and chamber works.